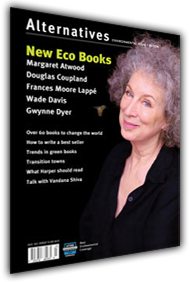 Alternatives Journal recently released its 3rd annual review of environmental books. Staff compile a list based on an informal survey of independent bookstores across Canada. While books on climate change dominate best seller lists, smaller bookstores continue to stock shelves with more practical titles—fiction and non. In fact, Environmental Fiction is now its own genre. Regreen: New Canadian Ecological Poetry by Madhur Anand & Adam Dickinson, eds. Information is important, but stories are essential. A plethora of recent book titles are out there for you to explore. Join us in celebrating environmental writing—and reading. Do you have a “great green read” to share? Here’s another — it didn’t make the Alternatives review but is worthy of mention! SOLAR, Author Ian McEwan believes novels without science are plain boring. Check out his new novel Solar – An engrossing, satirical and very funny new novel on climate change. With a global scope, Solar is a comedy dealing directly with the crises of today. I agree completely with the recommendation for Solar by Ian McEwan. The story is a hoot but it’s also very profound. The protagonist is a philandering physicist who makes a living giving expert talks about climate change. The story weaves in the latest geoengineering schemes to save our planet from climate catastrophe. The observation of one character, explaining why people aren’t comprehending the seriousness of the threat of climate change, was a real Aha! for me. She said something like, “to believe in climate change is to think about it all the time and I’m not ready to do that.” I thank McEwan for giving us a highly entertaining book which didn’t ask me to take my mind off climate change (no use there), but allowed me to laugh nonetheless.